Turmeric is a bright yellow spice. A member of the ginger family, turmeric is common in South Asian cuisine, especially in curry dishes; it’s turmeric that gives curry its bright yellow color. Nutritionally, turmeric offers vitamin C, the B vitamins, and curcumin, which is considered to have anti-inflammatory and antioxidant benefits. Turmeric can be used fresh but it’s most commonly found dried. Keep it at room temperature and use within about 6 months. Try adding it to soups, sauces, curries, and roasted meats. Turmeric is a member of the ginger family, which grows in the forests of South and Southeast Asia. It is commonly used as a dried, ground spice, especially in South Asian cuisine. As a dried spice, turmeric is usually ground into a fine powder that has a bright yellow color. In fact, it’s turmeric that gives curry its recognizable yellow color. Because turmeric imparts its signature color to fingers and cooking utensils, its best to wash your hands and cooking utensils soon after cooking to avoid stain. One tbsp. of turmeric contains 29 calories, 0.9g of protein, 0.3g of fat, 6.3g of carbohydrates, 2.0g of fibre, and 0.3g of sugar. Turmeric contains B vitamins and vitamin C. Turmeric also contains the active ingredient curcumin, which is considered an antioxidant. Note: Turmeric is used in some traditional healing practices. For example, in ayurvedic medicine, turmeric is used as an antiseptic. In Western medicine, turmeric is being evaluated for medicinal properties but no conclusive evidence is widely accepted yet. Dried turmeric can be found in the spice aisle of most supermarkets, in a sealed jar or bag. If possible, check the date on the container for freshness. If buying in bulk, check for a bright color and a strong, bright (not musty or dusty) scent. Fresh turmeric can sometimes be found at Asian or Indian markets or well-stocked health food stores. Fresh turmeric looks similar to ginger, but with an orange color. Store fresh turmeric in a plastic bag or covered container in the fridge. You can treat fresh turmeric much as you would fresh ginger: mince, peel, or grate it into dishes, or add slices to hot water for tea. Keep turmeric in a sealed container at room temperature, away from heat. Like most dried spices, it will start to lose its best flavor after 6-8 months. Fresh turmeric can be stored in the fridge for up to three weeks if it is left unpeeled. Add turmeric to curries, soups, sauces, and dry BBQ rubs, as you would other spices. To enhance the turmeric flavor in a dish, try the dry toasting method: in a sauté pan on low heat, add a tsp of dried turmeric, and stir with a wooden spoon. When the spice smells fragrant, remove from heat, or continue with your recipe. This dry toasting method will emphasize the flavor and scent. 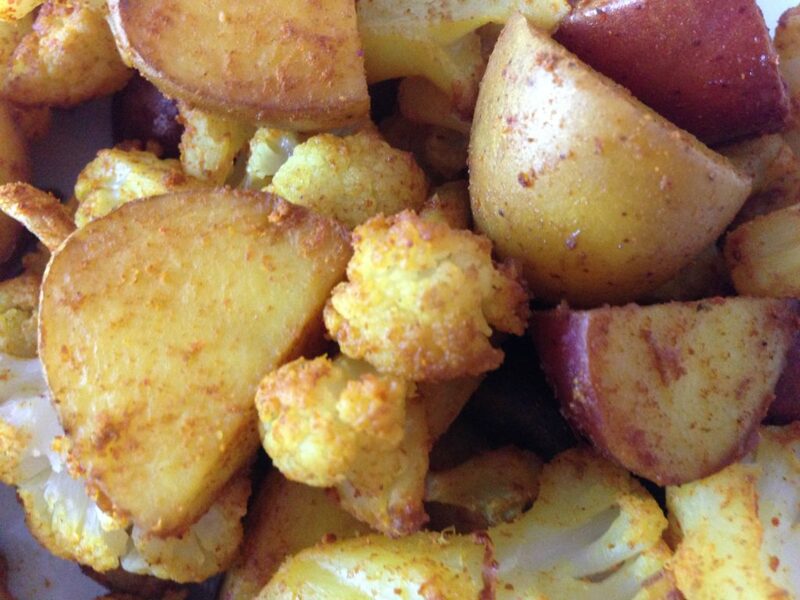 This recipe adds a punch of flavor to cauliflower and potatoes. It is perfect served as a side or enjoyed as a snack. Put all ingredients into a large mixing bowl and mix very well. Transfer contents into a 9” x 13” baking dish. Bake in preheated 350F oven for 1 to 1.5 hours or until cauliflower is lightly browned and potatoes are soft when poked with fork. To help ensure even baking, use a spatula to mix the contents of the baking dish every 15-20 minutes while baking.